Yes, I wore this today. The dress used to be longer, but I had it shorten by a whopping 8″ a year ago in the summer. So….too short? Or just perfect? 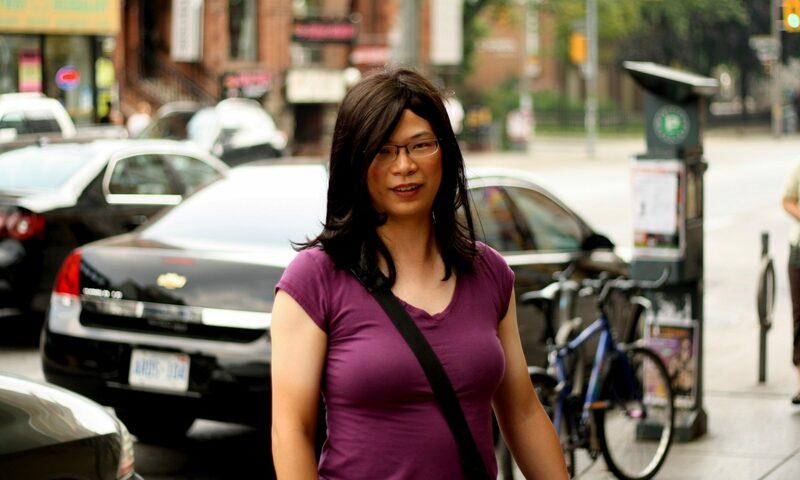 Years ago, when I hung out with the crossdresser community, I’d often wear women’s dress pants to our Saturday gatherings. Expectedly, the other girls teased me mercilessly. Saturdays, they said, are for parties, not working in the office. I shrugged off the comments. After all, my outfits still screamed femininity, but my friends weren’t wrong either: after dining and some dancing, I’d go back to my lab to work the night away. So three years ago, my New Year resolution was to completely stop wearing pants and only wear dresses and skirts. (I still occasionally wear pajama pants and/or yoga pants at home, just not in front of people.) As it turns out, this was the only resolution that I kept. Since then, I have donated all my dress pants to charity. The only garment that came close to pants are the leggings that I wear in the winter, which I feel should be in a different category altogether. I was elated to wear dresses everywhere. In the hot summer months I am definitely more comfortable, more feminine and cooler in a dress. The hemlines of my summer dresses have also gradually gotten shorter, to a point where I’m only marginally modest. Not that the students in my classes or the school have complained. And my legs are…not ugly. In the fall and winter months though, my legs are mostly covered in pantyhose (my feelings towards them vary from moment to moment) or leggings, and the open-toe sandals replaced by boots of various lengths. Yes, most of my winter dresses have hemlines below my knees, but on the less chilly days, I sometimes wear my short dresses too! Like today. What do you think? Is my polka dot dress too short? Or are my legs too long?